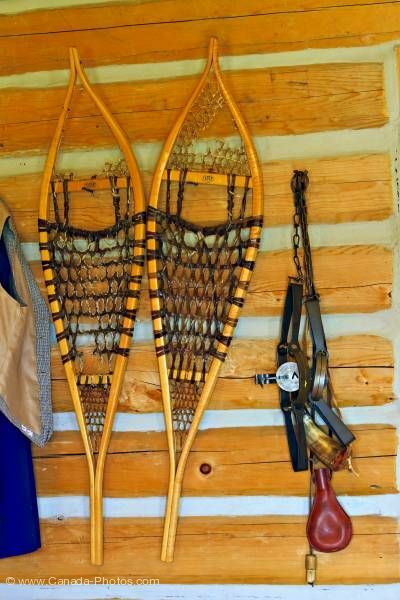 Photo of a pair of snowshoes and a trap hang on the wall of the warehouse/barn at the Last Mountain House Provincial Park, Saskatchewan, Canada. A wall of a log cabin displays wood snowshoes and a metal animal trap. The snow shoes show their wear with part of the netting torn and missing. Logs and mortar are the backdrop of the snowshoes and trap. This log cabin is used as a warehouse and barn at the Last Mountain House Provincial Park.